VW's wants to supply the electric version of the Up with batteries made in-house. WOLFSBURG -- Volkswagen Group plans to build drivetrains for its electric vehicles in-house. VW's components organization aims to become the system supplier for electric technology in the group so it can build up a competitive advantage, and safeguard expertise, locations and employment for the long term, a VW source said. For electric powertrains, the company is focusing on its Salzgitter, Germany, plant, where about 6,200 workers currently manufacture engines. VW's strategic goal in components is to be the regular production supplier for battery systems for the electric version of the new Up microcar starting in 2013, an internal strategy document says. 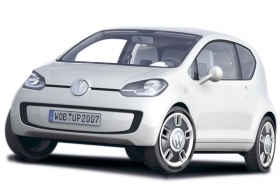 VW's new Up model line is due to be launched in 2011 with the electric variant following two years later. It is scheduled to be sold in the crucial U.S. market. VW is carrying out joint research and development with two Japanese firms, Sanyo and Toshiba, and China's, BYD. Karl-Thomas Neumann, the executive in charge of electric drive at VW, wants to make electrification one of Volkswagen's core competencies. "We are systematically taking the path leading to the electric vehicle," Neumann said. The ex-Continental CEO said VW needs to quickly build up electronic drivetrain expertise to remain competitive and to meet future regulatory and market demand for zero-emission vehicles. VW intends to introduce a "small, electric Golf test fleet" this year, Neumann said. A hybrid version of the Touareg SUV will make its public debut at the Geneva auto show early in March. Other automakers are also accelerating their activities relating to electric cars. For example, BMW plans to decide "fairly soon" where its MegaCity subcompact electric vehicles will be built starting in 2014.